A Plaistow, New Hampshire, woman who lost her daughter to a heroin overdose has found comfort in creativity and it's catching on. "I never thought I would do anything like this," said Mary Anne Zanfagna. 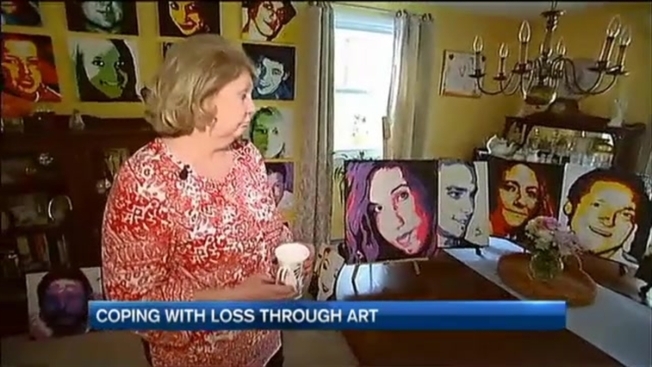 She spends her days painting pictures of tragedy and she started with her own. "I look at this sweet girl and then I sit back and think what happened," Zanfagna said through tears. The dreadful call came two years ago from her husband. Their 25-year-old daughter was dead - Jackie had overdosed on heroin. "I was just in total shock," Zanfagna said. The lifelong artist could barely get out of bed, never mind pick up a paintbrush - until six months later, when she first saw a portrait created in this style. "It was a fun and happy looking painting, so I thought, I'm going to do Jackie like that," Zanfagna said. She finally found comfort in her basement studio, pouring her grief onto the canvas. "I was painting her, but I was spending time with her, thinking about her," she recalled. Her daughter was the first smiling face Zanfagna finished. "The hot pink and purple, I said, 'that's it, those are her colors,'" Zanfagna recalled. She's painted 23 more, and sadly, is still counting. "It's haunting in so many ways," she said, looking at a wall of faces. Last year alone in the state of New Hampshire, a record 400 people died of overdoses. One of them was Amanda Jordan's 22-year-old son, Christopher. "I remember putting my head on him and he was just cold," Jordan said. "I still everyday wake up at two o'clock in the morning thinking he is coming home." Chris is one of Zanfagna's vibrant, smiling faces. "His smile is the smile I remember," Jordan said. And while she'd give anything to get her son back - Jordan feels she'll always have a piece of him in this painting. "His eyes are telling me, 'don't be sad, Mom, I am OK, you're going to be OK,'" Jordan said. "That's my greatest gift from this, to see how people respond," Zanfagna said. "I look at it every day, every single day," Jordan said. Both moms are on mission to make addiction treatment more widely available. On Wednesday and Thursday, Jordan and Zanfagna are in Washington, displaying the "Angels of Addiction" portraits and telling their stories to Congress. For more information, go to angelsofaddictions.org.